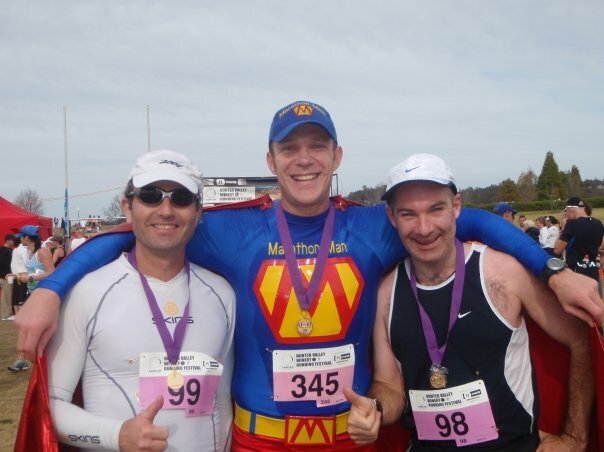 Trent, Denis and I were ready for the 1/2 marathon in the Hunter Valley. After a nice steak and some local red wine the night before we felt great at 8.30 in the morning – a cool but clear day and 21 km laid ahead of us. 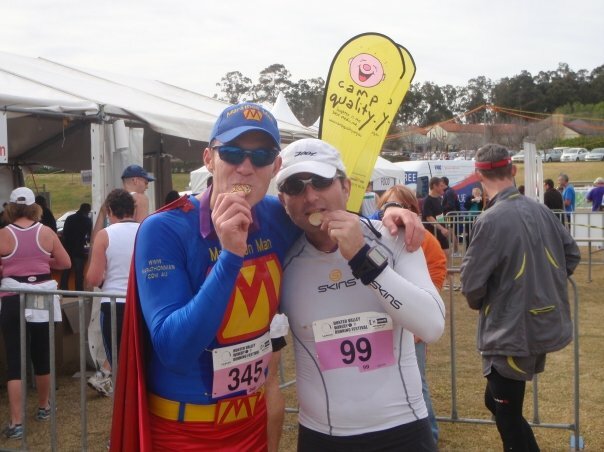 Denis and I signed up as a team ‘Run4Vision’ – competing in the 1/2 marathon were our times get added up for a marathon time. 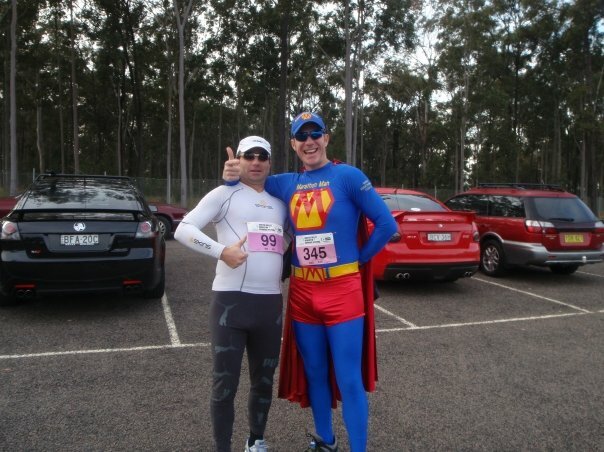 Marathon Man was here to run a new PB. The first few km’s were through the beautiful Hunter Valley Gardens and across some wines before we had to start climbing the hill up to Wilkinson Vineyard and then on to Tulloch Wines. Shame we only got water and High 5 at the drink stops. The long way out and back towards Cessnock airport was always a challenge – I don’t particulary like to see the leaders and faster runners coming back towards me when I still had to run 6 km to the turn-around point. After a good first 10km (49’30) I left Marathon Man behind at a drink station and kept going trying to speed up for the second half. I started overtaking runner after runner until one guy did not like me to get passed him – for about 4 km we battled on up the hill towards Pokolbin Estate where I had to let him go but thanks to the increased speed I managed the second 10km in 48’30 and finished the 1/2 marathon in 1.43’03. I was happy with that result considering my reduced training. Marathon Man ran a new PB in 1.47’20. Denis beat us both with 98’24 with team ‘Run4Vision’ finishing in 2nd position. I have to get back a bit more into long runs but the track and tempo training is showing results and I am looking forward to the marathon in October. There will be a couple of more smaller races to run in the next few winter weeks before the Fitzroy Falls Marathon. My goal is to finish that off road race under 4 hrs.